Cabinteely parkrun is a FREE weekly 5km event for runners of all standards, which takes place every Saturday at 9:30am in Cabinteely Park, Old Bray Road, Cabinteely, Dublin 18. It is not a race against other runners, but a 5k timed run and it can really be whatever you want it to be, whether that's for fun or as part of a training plan. Every week we grab a post parkrun coffee in The Cabinteely Park cafe - please come and join us! Maybe swap stories about your run that day, chat to other runners over a cup of tea or coffee and just be an important part of this new running community. Dun Laoighaire-Rathdown County Council: Cabimteely parkrun is part funded by Dun Laoighaire-Rathdown County Council. 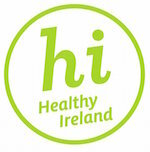 HSE: The evidence base for promoting an active lifestyle for well-being is well documented. Mass participation & community events are being heralded for their potential to get people started and help those who have committed to the change to stay moving. Through the HSE’s Get Ireland Active initiative we are a proud supporter of parkrun and firmly believe that such an event will serve as a fantastic enhancement to the community of Cabinteely.